Toronto is hosting a unique exhibit on November 12 in relation to a three-day international religious art conference. 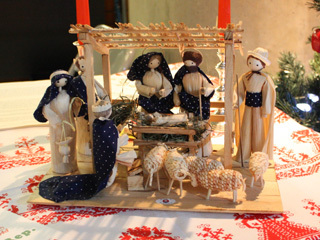 World of the Creche will feature a major exhibition of Christian nativity scenes. You might remember a similar show in our city hall rotunda last December. This one will be much bigger with creches from private and religious collections from around the world. A special section will be on those made by our First Nations people and early missionaries to Canada. A highlight will be creches that brought comfort to the military during wartime. Also of importance will be the Czech paper creches used after Emperor Joseph II banned the building of crèches in churches at the end of the 18th century. 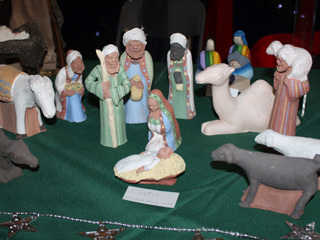 Creche-making demonstrations and creche-related vendors will also be on hand. Creches are an art form as well as a religious Christian expression. Coptic Creche. Image©Ruth Lor Malloy 2011. The exhibition will be on Saturday from 9am-12:30 noon and cost $5 for adults. Children under 14 are free and must be accompanied by an adult. It will be on the convention floor of the Fairmont Royal York Hotel, across from Union Station on Front Street. Among the sponsors are the Hudson Bay Company and St. James’ Cathedral. For information on the convention, click on: http://bit.ly/vtoNnD. You can order timed tickets for the exhibition on: http://friendsofthecreche.eventbrite.com/. For our blog on last year’s Christmas Around the World, see: http://bit.ly/nkEI5o. Hi Shelley, I have just forwarded your message to the organizer of the Creche exhibition. I hope she has time to answer it. Ruth. Just received this message from the organizers of the Creche Exhibit: Thank you Ruth for including us on the multi-cultural calendar of events, and I hope you have made reference to the fact that the public are welcome to come to see the exhibits in the Ballroom, Convention Floor, Fairmont Royal York Hotel on Saturday morning, November 12th between 9:00am and 1:00 pm. Admission $5 for adults and children under 14 free. Children must be accompanied by an adult. Thank you too for drawing our attention to Georgi Danevski. There is such a wealth of talent in the Toronto area and we are indeed fortunate. Several are involved in the program. I am forwarding your e-mail to Jill Walkingshaw, Chair of Exhibits. Am not sure if there is still time or space available, but will forward to her just in case. If not now, possibly sometime in the future. We are though taking a group to Montreal and St. Joseph’s Oratory!